Set the tone early, offset any bad rumors, be candid. Utilize "human factors" and be open about feelings and motives: this will enhance trust. Avoid presenting too many issues, highlight the strongest ones. Avoid deadlines, lessening the chance for needless concessions. Summarize frequently: this enhances understanding. Present arguments calmly, without personalization, and make sure they are logically supported. Avoid use of personal opinions in arguments. 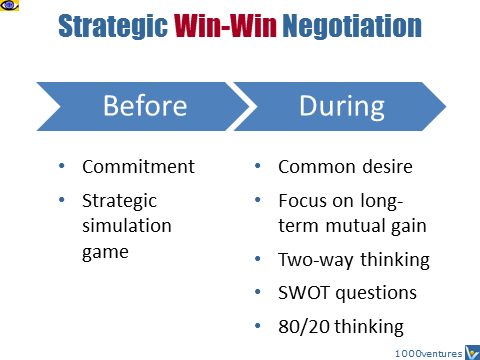 Avoid ultimatums and other forms of non-negotiable demands. Admit, when appropriate, the validity of the other party's arguments. According to 80/20 Principle, 20% or fewer of the points at issue will comprise over 80% of the value of the disputed territory; 80% of the concessions will occur in the last 20% of time available. Socrates used this technique more than 2300 years ago. He pretended ignorance in order to encourage others to express their views fully. Today, many world's smartest and fastest businesspeople have perfected this art – consciously or unconsciously – of paying dumb. "People who try to impress by pretending to be smart generally aren't. Truly smart people know that by playing dumb and asking the other party to repeat or explain things several times, asking lots of questions, they'll be better prepared to respond and then make a fast decision." Never conduct negotiations before 10 a.m. or after 4 p.m. Before 10 you appear too anxious, and after 4 they think you're desperate.